This report is a companion to the Transition Evidence Grid. 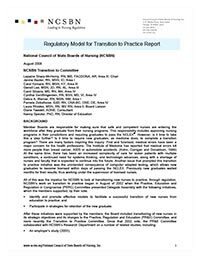 The report synthesizes all the evidence on transitioning new nurses to practice. It illustrates the importance of formal transition programs in protecting the public, and it provides the data that support the components of the Transition Regulatory Model. This report was adopted by the May, 2008 NCSBN Board of Directors.